Gates open from 10am to 5pm. 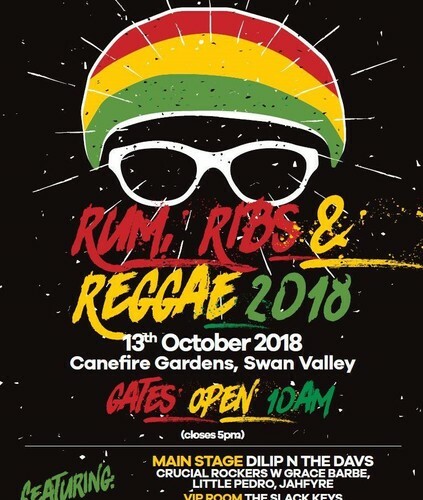 Rumfest 2018: Rum, Ribs and Reggae extravaganza in the Swan Valley on October the 13th. We're using local Reggae entertainers, a variety of local Rib Food Trucks and serving only WA produced and owned Beer, Spirits and Cocktails. We will also feature a whopping 4kg rib-eating competition on the day! It will be a intimidate gig with less than 1000 attendees with a focus on guest experience showcasing WA owned and made.